Long evenings are finally here! Whilst the sun isn’t always guaranteed, one trend that takes over whatever the weather is Great British festival season, bringing over 1,000 events to an outdoor stage in a field near you this Summer. Whether you are running a festival, have a brand presence on site or are creating a festival-inspired event like Selina and Nick’s wedding below, there’s a lot to organise and even more eventualities to prepare for. From attending the event production show earlier this month and chatting with events professionals in the Ta Dah networking area, one of the hot industry topics which came up again and again was design. Specifically, how to make the most of every element at an event for the best brand experience. 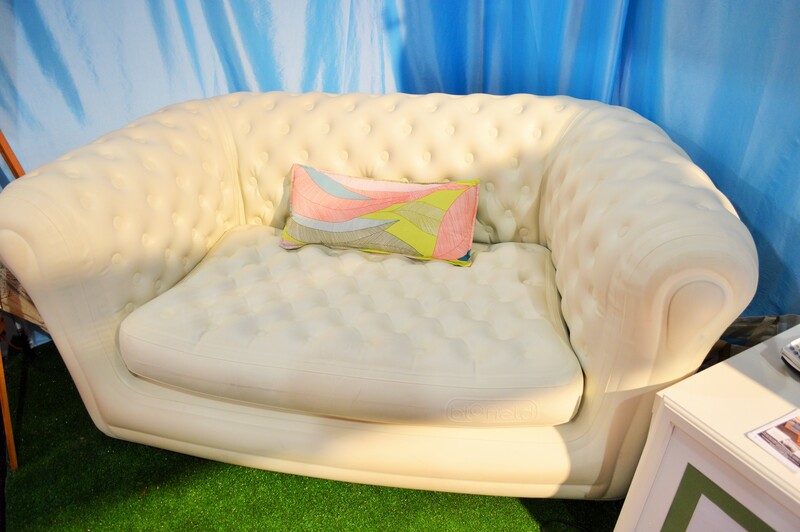 We have added Blofield Air Design Do Nuts to our extensive air filled Chesterfield hire range. The DoNut is a striking table-seating combination with an inflatable doughnut-shaped seating part, allowing six people to join the table. We’ve selected coverings in the gorgeous Animali range with white or black Python print. We can’t wait to unleash these on the UK hire market! Full shots will be added to the Hire Collection area of the site very soon. ENQUIRE NOW! Ta Dah Furniture Hire are sponsoring the healing area for Therapies @ Awareness Festival next weekend. We are helping to create the perfect chill out space for their holistic treatments, massage and healing. Wonderful words from Jenna at Glitterdaze! At The Wedding Fair I visited at EventCity, Manchester last weekend I was totally amazed and thrown back to the 2000′s with these inflatable sofas! Read more about Wonderful words from Jenna at Glitterdaze! We are very excited to inform you that our Social Media platforms such as Facebook, Twitter, Youtube have been available to public. Join us for more news and information about our promotions. TaDah Furniture Hire website is now live! TaDah Furniture Hire is thrilled to announce the launch of our official website www.Tadahfurniturehire.co.uk. Please scan through our pages, particularly our gallery to have more details of who we are and what we have to offer. - Tadah Furniture Hire Team. Read more about TaDah Furniture Hire website is now live! Ta Dah Furniture Hire will be showcasing our air filled Chesterfield sofas at the North West Wedding Fair Event City Manchester 27-29 Sept . Visit Ta Dah Furniture Hire at stand J17 to experience our stylish pop up sofas and enter the free prize draw to win a Big Blo armchair.